Seems to be 200 plus at other retailers such as laptops direct...granted not the best platform since cannonlake released but just like everything else PC related theyre either out of stock or heavily inflated in price. Not sure if you read and understood Cows point or just on a Sunday morning troll? Just a shame that a quick look on Amazon gives the motherboards at circa £200. How do you run that cpu at 4.5ghz? Thought you could only oc cpus with the K edition. Yes, you can with some motherboards that allow bclk over clocking. I'm running at 132*34 mhz 1.35v atm with LLvdroopthing setting on mode 1, it was surprisingly easy and runs prime95 with no errors. Got a big heat sink of course. I think this is restricted to skylake gen only. Do CEX take Heroin? I've got loads of it lying about after giving it up recently, could bag myself a nice CPU there isn't it. LGA2066 is a pointless consumer platform if you put anything less than an 8 core on it. This 4 core 4 thread i5 CPU plus a 'cheap' new X299 board will be £350. Whereas a brand new i5 8400 six core six thread and a really good spec Z370 board would be less, and it would be much faster. LGA2066 is a pointless consumer platform if you put anything less than an …LGA2066 is a pointless consumer platform if you put anything less than an 8 core on it. This 4 core 4 thread i5 CPU plus a 'cheap' new X299 board will be £350. Whereas a brand new i5 8400 six core six thread and a really good spec Z370 board would be less, and it would be much faster. I hear you and this is very niche but you can buy the i7 version of this (i7-7740X) for £189 and that is possibly the fastest 4C/8T chip available once over-clocked. Sure the boards are £200 plus but at least you are buying into a platform that scales to high core counts now and should be due a 10nm upgrade in a year or more. Whereas Coffee Lake is a dead end and only scales to 6C. Very niche admittedly but such is life. 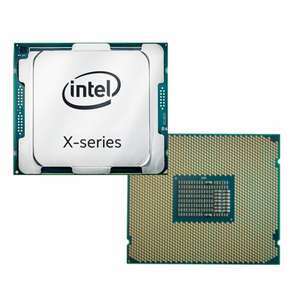 More interestingly is the i7-7800X 3.5GHZ (SKYLAKE X) 6 core for £249 as much cheaper than Coffee Lake and not a dead end platform plus actiually in stock. I hear you and this is very niche but you can buy the i7 version of this …I hear you and this is very niche but you can buy the i7 version of this (i7-7740X) for £189 and that is possibly the fastest 4C/8T chip available once over-clocked.Sure the boards are £200 plus but at least you are buying into a platform that scales to high core counts now and should be due a 10nm upgrade in a year or more. Whereas Coffee Lake is a dead end and only scales to 6C.Very niche admittedly but such is life.More interestingly is the i7-7800X 3.5GHZ (SKYLAKE X) 6 core for £249 as much cheaper than Coffee Lake and not a dead end platform plus actiually in stock. I understand the platform will have a better scaling at the top end, but for the £189 CPU plus a 'cheap' £200 board you're getting £389 performance which is LOWER than a £180 i5 8400 put on one of these cheap £120 Z370 boards, so £300. That's an £89 saving for more performance the entire time you run these machines. That could be a year or more before you upgrade. Then ok, by the time you get around to spending what like £300-400 on an 8 core 7820X when they get down to that (they are like £500 at the moment) it'll likely be better just to drop in an (also by then likely cheaper) 8700K onto your Z370 saving even more money for similar performance for the kind of mainstream tasks consumers would do. Or just refresh your mainstream platform altogether because their IPC is too slow compared to newer cheap parts. If we're talking years down the line. It's a super teeny tiny niche that would buy a Kaby Lake X quad core. I'm sure a few people might, but by and large, most should not. I understand the platform will have a better scaling at the top end, but …I understand the platform will have a better scaling at the top end, but for the £189 CPU plus a 'cheap' £200 board you're getting £389 performance which is LOWER than a £180 i5 8400 put on one of these cheap £120 Z370 boards, so £300.That's an £89 saving for more performance the entire time you run these machines. That could be a year or more before you upgrade. Then ok, by the time you get around to spending what like £300-400 on an 8 core 7820X when they get down to that (they are like £500 at the moment) it'll likely be better just to drop in an (also by then likely cheaper) 8700K onto your Z370 saving even more money for similar performance for the kind of mainstream tasks consumers would do. Or just refresh your mainstream platform altogether because their IPC is too slow compared to newer cheap parts. If we're talking years down the line.It's a super teeny tiny niche that would buy a Kaby Lake X quad core. I'm sure a few people might, but by and large, most should not. It's very niche but for someone building a DAW now for example who wants a platforms that scales well because they don't want the hassle of dealing with de-authorising and re-authorising all their plugins etc paying a relatively small premium for a motherboard that will grow with them can be seen as good value. A lot of DAW users would still be better off with a faster clocked 4C/8T than a slower 6C/6T currently so they get a better CPU now plus future proofing. The 8700K is not good value even at £350 as the i7-7800X is a £100 less which will make up for the differnce in the board price. Z370 is no good for a long term upgrade. It's very niche but for someone building a DAW now for example who wants a …It's very niche but for someone building a DAW now for example who wants a platforms that scales well because they don't want the hassle of dealing with de-authorising and re-authorising all their plugins etc paying a relatively small premium for a motherboard that will grow with them can be seen as good value.A lot of DAW users would still be better off with a faster clocked 4C/8T than a slower 6C/6T currently so they get a better CPU now plus future proofing.The 8700K is not good value even at £350 as the i7-7800X is a £100 less which will make up for the differnce in the board price.Z370 is no good for a long term upgrade. I'm no fan of Macs but if you want a DAW even I admit they are probably better. I'm also unsure you'll really need something insane for a DAW like an 8 core anytime soon. Maybe if you're just building some ultimate machine with a really big budget. Which is why you're right about having less cores but higher clocked still leans itself heavily towards the mainstream platforms again for most people. 8700K really exists for gamers and consumers. It will (and does) beat up the 7800X because of higher clocks and the mesh topology of those SkyLake X processors seem unsuited to gaming in particular. 7800X is also not £100 less, it might be like £50 less for the CPU, while equivalent x299 boards are £100 more. So it's not really cheaper. It's about £50 more expensive. 8700K renders the 7800X virtually obsolete as a new platform purchase proposition, for most consumers. I'm no fan of Macs but if you want a DAW even I admit they are probably …I'm no fan of Macs but if you want a DAW even I admit they are probably better. I'm also unsure you'll really need something insane for a DAW like an 8 core anytime soon. Maybe if you're just building some ultimate machine with a really big budget. Which is why you're right about having less cores but higher clocked still leans itself heavily towards the mainstream platforms again for most people.8700K really exists for gamers and consumers. It will (and does) beat up the 7800X because of higher clocks and the mesh topology of those SkyLake X processors seem unsuited to gaming in particular. 7800X is also not £100 less, it might be like £50 less for the CPU, while equivalent x299 boards are £100 more. So it's not really cheaper. It's about £50 more expensive. 8700K renders the 7800X virtually obsolete as a new platform purchase proposition, for most consumers. As I mentioned initially the 7800X is only £249 from OcUK which considering that the 8700K is still MIA unless you want to pay a massive premium makes it at least £100 less. But that's not really the issue I was focusing on which was about good 4C/8T now with a wide upgrade potential well down the line. A 6C/12T on 10nm for LGA2066 might look very good when a DAW user is ready to upgrade in 3+ years. I'm no fan of Macs but if you want a DAW even I admit they are probably …I'm no fan of Macs but if you want a DAW even I admit they are probably better. Not really as most software runs on both platforms with only a few being platform specific. As I mentioned initially the 7800X is only £249 from OcUK which …As I mentioned initially the 7800X is only £249 from OcUK which considering that the 8700K is still MIA unless you want to pay a massive premium makes it at least £100 less.But that's not really the issue I was focusing on which was about good 4C/8T now with a wide upgrade potential well down the line.A 6C/12T on 10nm for LGA2066 might look very good when a DAW user is ready to upgrade in 3+ years. The 7800X is the better deal you should have posted that. The very cheapest 'budget' x299 board on their site is £200 though, so it's £449 and it's still a bit slower than the 8700K like I said. Availability is better though! If an 8700K is as much as £380 and a good board £120 then it's £50 more for a bit more speed. DAW could be PC or Mac, but I just know I would prefer Mac as a PC user myself if I was serious about it. Like was said. If you want a 4 core 4 thread and go to a 6 core it will still be cheaper down the road on the mainstream platforms for likely a bit more performance. If you buy now you have to buy that 7800X because that's the best deal. If you buy now you have to buy that 7800X because that's the best deal. Not if you just want the highest clock speeds and power efficiency for a quiet system. Not if you just want the highest clock speeds and power efficiency for a …Not if you just want the highest clock speeds and power efficiency for a quiet system.DAW users aren't normal! Well in that case you have to buy the mainstream platforms! Lol but you should post the 7800X deal. I don't know how well it would go down here but if you point out it's close to 8700K performance and overall not as expensive even with the costly x299 platform it should do well. Also it's actually available right now! Was the bclk thing not patched for the 6700 and 6500? as above really, for the CPU alone it's a good deal, but once you add the motherboard, you're much better off going mainstream with an 8th gen i5 or i7. as above really, for the CPU alone it's a good deal, but once you add the …as above really, for the CPU alone it's a good deal, but once you add the motherboard, you're much better off going mainstream with an 8th gen i5 or i7. Well, I disagree - it very much depends. The enthusiast platform usually supports more memory (up to 128GB!) and has more PCI-e lanes, which are useful for Crossfire or SLI. It seems the max memory and PCI-e lanes depend on the CPU en.wikipedia.org/wik…066 and this would be a prime reason for me to go for a 7800X. The 7640X only supports 64GB and 16 PCIe lanes. Overall the enthusiast platform has lots of features and lots of connectors on the motherboard. Useful for a workstation, but normal users won't really benefit from that. I'm a bit puzzled by Aghartas comment about "power efficiency" - this is certainly not a feature of the enthusiast platform. Even the motherboards often draw a lot of power based on my experience with a i7-3930k. Well, I disagree - it very much depends. The enthusiast platform usually …Well, I disagree - it very much depends. The enthusiast platform usually supports more memory (up to 128GB!) and has more PCI-e lanes, which are useful for Crossfire or SLI. It seems the max memory and PCI-e lanes depend on the CPU https://en.wikipedia.org/wiki/LGA_2066 and this would be a prime reason for me to go for a 7800X. The 7640X only supports 64GB and 16 PCIe lanes.Overall the enthusiast platform has lots of features and lots of connectors on the motherboard. Useful for a workstation, but normal users won't really benefit from that.I'm a bit puzzled by Aghartas comment about "power efficiency" - this is certainly not a feature of the enthusiast platform. Even the motherboards often draw a lot of power based on my experience with a i7-3930k.